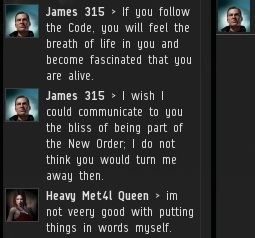 In two previous posts, I shared a lengthy conversation I had with Heavy Met4l Queen, the self-proclaimed leader of the miners' resistance against the New Order. 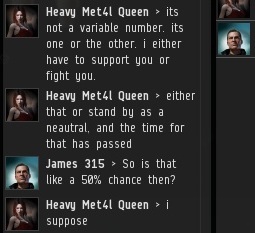 After a shaky start, we finally got around to discussing the possibility of HMQ switching sides and joining us. 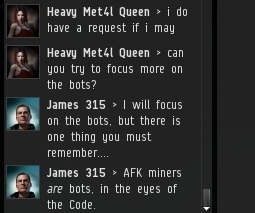 HMQ was of two minds; drawn to the Code in part, but also holding onto a desire to mine AFK and not pay for mining permits. I wanted to discuss specific ways that this gap could be bridged. 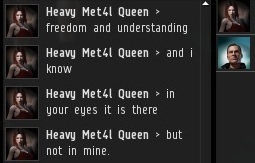 Clearly HMQ needed to get her eyes checked. 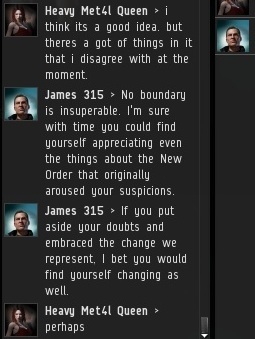 The New Order is chock full of freedom and understanding. 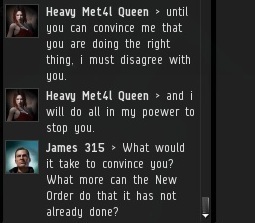 In my opinion, if miners simply join the New Order first, and save their objections for later, they'll have fewer objections. Even our most implacable foe admitted to at least a 50% chance of switching sides. If there's a 50% chance of rain tomorrow, you bring an umbrella. Progress! Then came a brief discussion of the ongoing wardec between her mining corp and Arctic Dungeon, a corp loyal to the New Order. With the war just beginning, HMQ was confident her corp--full of newbies--wouldn't lose any of its mining ships (mostly retrievers). 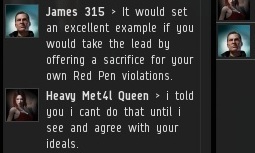 Shortly thereafter, her corp lost 100 million isk worth of mining ships. After all this time, miners still have difficulty coming to grips with the spirit of the Code. 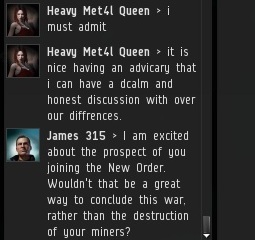 Finally, I asked HMQ if her defection to the New Order could trigger a breakthrough among the rebellious miners she represented. Ultimately, the negotiations proved inconclusive. HMQ has not yet taken steps to resolve her Red Pen violations. 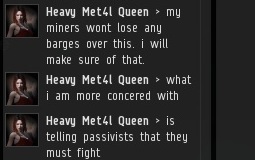 On the other hand, the miner rebellion seems to have fizzled out: The effort to organize a mass-petition against us went nowhere, and all efforts to suicide gank our bumping ships ended in disaster for the rebels. Meanwhile, new Agents flock to the New Order with each passing day.